Floristry can be a challenging profession. 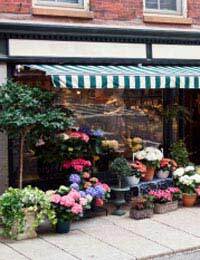 Not only are most independent floristry shops open an average of six days per week, but florists often obtain their stock from early morning flower markets as well working during normal business hours. In floristry businesses employing few other employees, this type of schedule leaves a florist carrying a very heavy workload. Yet the floristry industry has experienced a bit of a boom since the 1990s and many florists report finding great satisfaction in their work. If you are considering setting up a floristry business then be sure to obtain a professional qualification and work experience in floristry, carry out market research on florists in the area you envision working in and devise a viable small business plan for your dream floristry business. There are a variety of options for obtaining qualifications in floristry in the United Kingdom. NPTC, BTEC and City & Guilds all offer qualifications in floristry, and apprenticeship schemes are also available leading to some levels of NVQ qualifications. There are over 100 colleges in the UK which offer "college based training" in floristry as well, though the programmes of study and the qualifications to which they lead can vary greatly. For detailed information about obtaining a professional qualification in floristry contact the Society of Floristry, an organisation for professional florists. In addition to learning the technical skills of floristry, you will want to obtain work experience in order to practice applying these skills in "the real world" before setting up your own business. In fact, if you require an sort of loan from a bank or private investor to get your floristry business set up then a creditor will almost certainly want to know your background in the industry before giving you access to their money. Finding paying employment in the floristry industry may require calling in to individual flower shops or market stalls, as well as scouring job advertisements both in print and online. The institution at which you studied for your professional qualification may also advertise paying positions. If you can not secure paid employment then you may be able to volunteer at a shop or stall in order to gain experience too. Prior to writing up your small business plan you will need to conduct detailed market research on the area in which you'd like to set up your floristry business. Look around at how many other florists, garden centres, nurseries and even grocery stores, petrol stations, green grocers and newsagents are already selling flowers in the area. Research the types of customers these business have, the stock they offer, if any other services are offered, if any outlet is a part of a delivery network such as InterFlora or TeleFlora, and even how the shop or business looks to the average passer-by. You will also want to look at available locations and units for retails stores, the cost of leasing or purchasing such a location, if you will require business transportation and the associated costs, how much insurance you will need to carry, your business banking options, if you will be able or would like to join delivery networks, how and where you will advertise and if there are any other options (teaching workshops, offering bespoke home arrangement services, etc) that you may be able to add to your floristry business. Once you have conducted your market research, take this information and translate it into a small business plan. This document is a necessity for proving to potential creditors that you know what you are doing and that the risks of investing in your business are no greater than investing in any other business. In general a small business plan will involve an executive summary, description of the business, market analysis, description of the owner/management team, an overview of how the business plan will be implemented, projected risks and financial projections. Banks may have particular formats that they require for business plans when submitted in application for a loan. Business Link (England), Business Gateway (Scotland) and Flexible Support for Business (Wales) may also be able to provide information and advice. Setting up a floristry business is an exciting prospect. Obtaining a professional qualification and work experience in floristry, conducting market research on floristry businesses and writing up a small business plan for your future business are all important steps toward turning your dream into a reality.